Pax Britannica? is a study of Britain's international role and foreign policy during the century of her imperial greatness. The study shows how her foreign policy was affected, and to some extent, dictated by her domestic political issues. 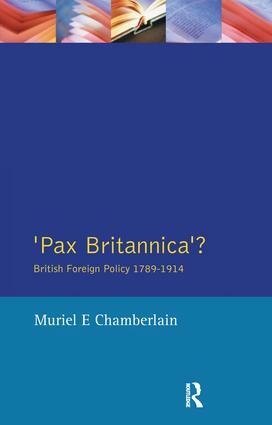 In her stimulating and readable study, Dr Chamberlain explains the how the whole nature of foreign-policy making changed in the nineteenth century. Once the preserve of a small handful of monarchs and professional diplomats, it was transformed by the expansion of the fanchise, the influence of the press and the mobilisation of public opinion by men such as Disraeli and Palmerston.